YATRON International Co. Ltd , General Electric (GE) of the long-term partner – is one of the important institutions in YATRON Group. We provide various consumer goods for the global consumer, at the same time, YATRON also a number of products distributor and importer in Greater China. YATRON International not only pays attention to the market needs, also more concern on consumer needs, therefore, the product areas covered F&B, Gift, jewelry, health food, 3C electronic products, child and pet supplies and more. 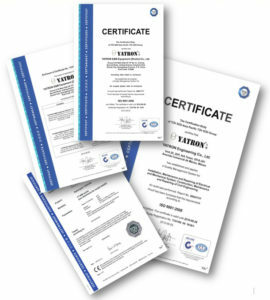 Furthermore, in order to let consumer feel relieved when using our product, Teng Group has also adopted a number of certification (ISO, Germany TUV and other third-party impartial organization), YATRON will do the most rigorous checks on behalf of consumer, will introduce the world’s trusted and high reputation brand into the Greater China region. YATRON international attach great attention to the Taiwan market, therefore, we based on Taiwan, will set up its first overseas branch in Taipei 101, the expectations and efforts to provide the best merchandise to consumers, will also provide the best pre and after-sales service for the Taiwanese consumers.